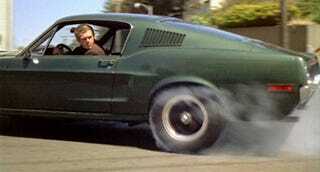 So, You Want To See Bullitt As Intended? The Redford Theater is one of those places which breaks the mold of blandly nauseating suburban mega-theaters sporting 30 cookie-cutter, no personality movie holes. You go to Redford Michigan's oldest operational movie theater not because of the latest in high-test gee-whiz surround sound, nor do you go for the comfy seats or the fully digital projectors - it doesn't have any of that - you go to recapture the joy of the movies. Not too long ago, we noticed the theater would be showing a movie containing what many have called the greatest chase scene ever filmed, Bullitt, and we're wondering if you're interested in going. Yes indeed folks, just as if it were the old days, Bullitt will be shown in two parts in the very cool, very swank Redford Theater, and we're interested in a meet up. Bullitt will be showing in the Chinese theater themed house of movies on two days - March 15th and 16th, so we'll need to narrow things down a bit. The polls below are for two items of bidness. First we need to warn the theater of how many car nerds are interested in going, and second we need to know which day is better for the watching. It's easy to understand passing if you live far away, but if you're in the area there's really no excuse. Come on, they're running Daffy Duck and Porky Pig cartoons and will be wailing on one of two remaining pipe organs in the city during intermission, how can you pass?